On September 28, 2018, a powerful 7.5-magnitude earthquake and an unexpected tsunami shook the Indonesian island of Sulawesi, leaving behind catastrophic results and open questions among geoscientists. How come this event is having such an impact on the scientific community? Figure 1. Map of Indonesia, showing the four Greater Sunda Islands, the location of the 2018-09-28, Mw7.5 Palu earthquake and its focal mechanism. 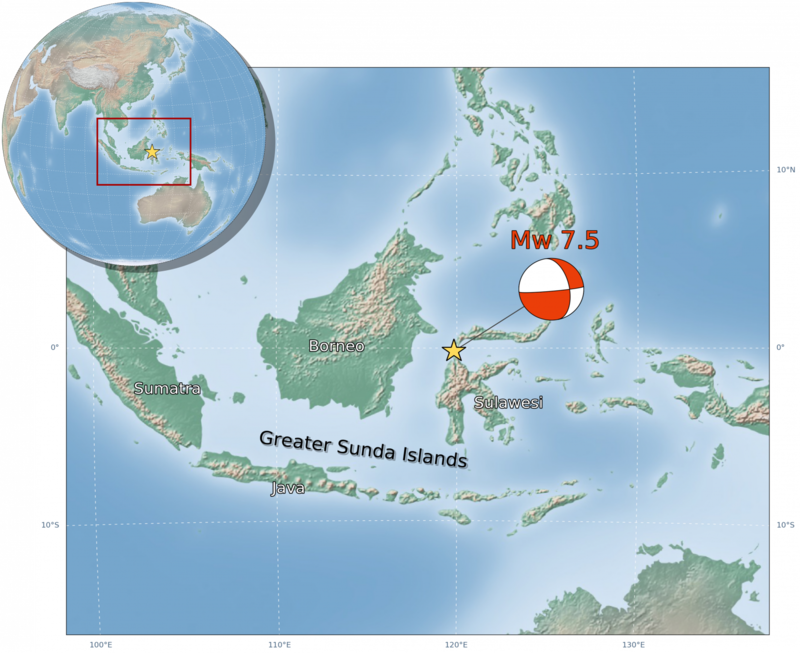 On Friday afternoon (at around 5pm Western Indonesian Time) the Minahassa Peninsula on Sulawesi island was struck by a Mw7.5 earthquake (Figure 1) . The main shock occurred on the strike-skip Palu-Koro fault, one of the most active structure in Sulawesi . The epicenter of the quake is located 27 kilometers northeast of Donggala, at a depth of 10 km . 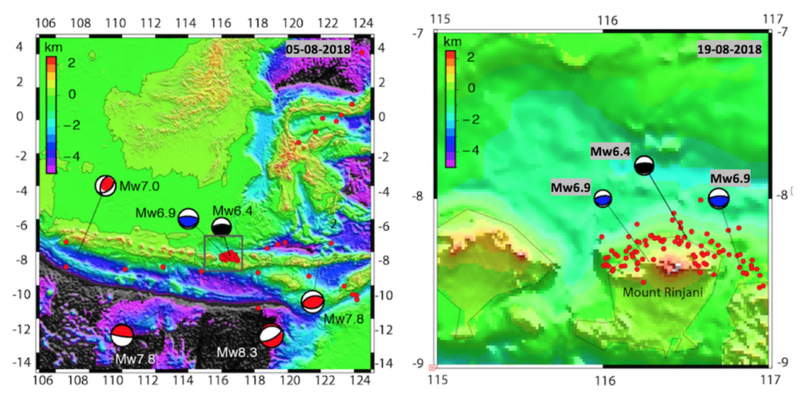 By looking at the aftershocks distribution from within 4 days after the Mw7.5 event (Figure 2), we can approximately estimate a rupture extent ranging from a few kilometers to the North of the epicenter over about 200 km to the South . The rupture area is thus roughly 200x20km, mainly located South of the hypocenter and ending in the city of Palu (Figure 2). Nothing surprising by now, but the intriguing part is coming. Figure 2. Aftershocks distribution (coloured circles) from within 4 days after the Palu earthquake event occurred on 28 September. Hypocentral depth and magnitude are shown respectively with the colour scale and the circle size. The Palu-Koro fault is indicated in black. The mainshock event lies in the centre of a large aftershock cloud stretching over more than 200 km in N-S direction. 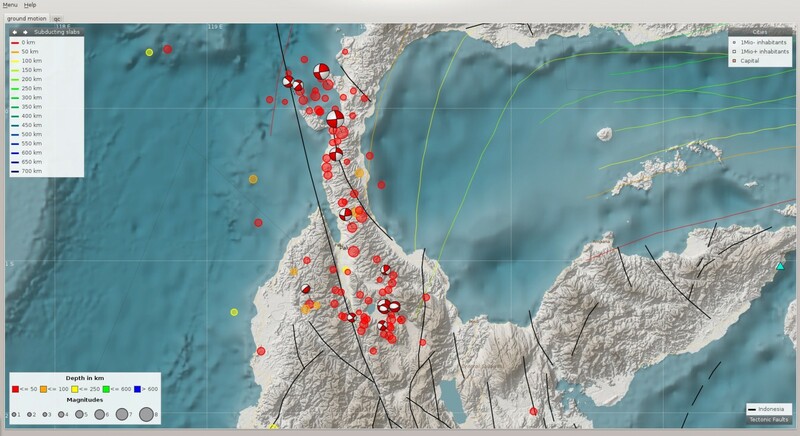 Picture taken from Global Earthquake Monitoring Processing Analysis (GEMPA). By looking at the source time function of the Palu earthquake (Figure 3), we can deduce that the event took about 30s to rupture a length of 200km, suggesting a supershear rupture velocity. While most seismic ruptures propagate at speeds lower than the S-wave speed, supershear ruptures propagate at speeds between the P and S waves. Supershear ruptures are extremely rare events which, in the past, mostly propagated on very smooth part of strike-slip faults . Coincidentally, first estimates of surface displacements along the Palu-Koro fault show a very sharp offset between the two sides of the fault, suggesting that the rupture propagated on a linear, very smooth segment of the fault. 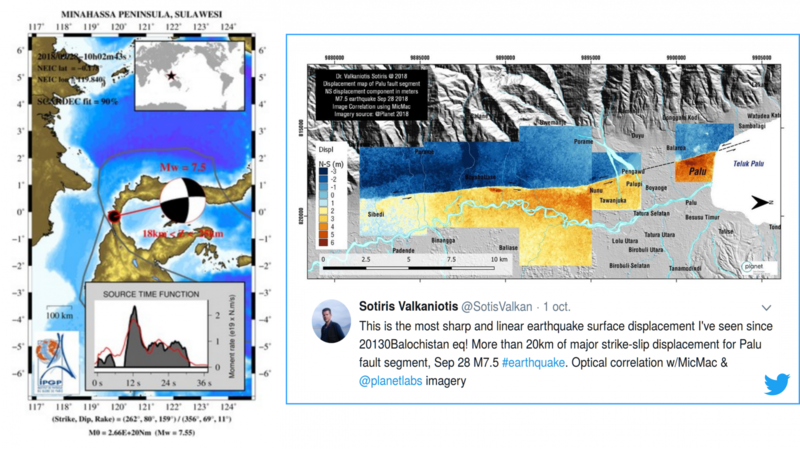 “This is the most sharp and linear earthquake surface displacement I’ve seen since 2013 Balochistan eq!” says geologist Sotiris Valkaniotis on his twitter account. And the image [Figure 3] has already gone viral on the net. Further study will be necessary to confirm if this event is in fact supershear. Figure 3. On the left: source time function of the Mw7.5 Palu earthquake and its focal mechanism. The Palu earthquake took about 30s to rupture a length of about 200km along the Palu-Koro fault segment. Picture from GEOSCOPE Web Portal . On the right: displacement map of the Palu-Koro fault. Colorscale from red to blue represents the North-South displacement in meters. Picture realized and posted by geologist Sotiris Valkaniotis on his twitter account. Sulawesi is one of the Greater Sunda Islands , a group of four large islands within the Malay Archipelago including Java, Sumatra and Borneo (Figure 1). An intricate pattern of faulting scars the land: collisional orogenies, subduction zones, rift systems and transform faults pile up in this area , making the island prone to earthquakes. 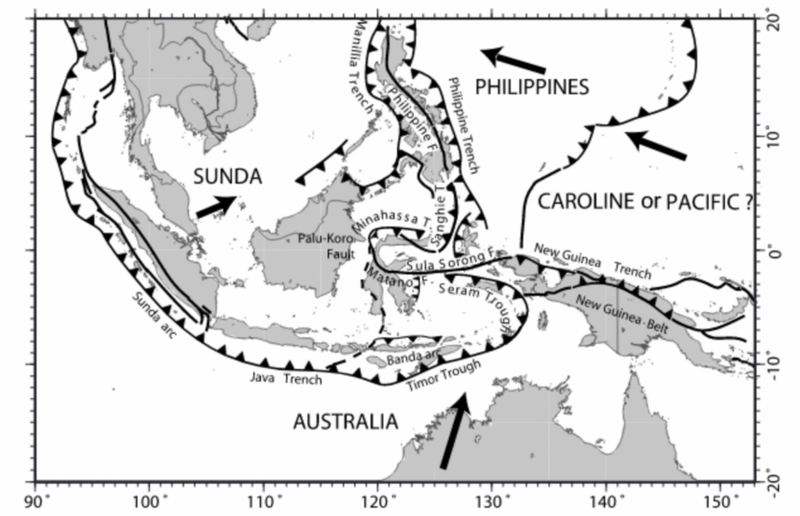 From a tectonic point of view, Sulawesi lies within the triple junction of the Australian, Philippine and Sunda plates and accommodates the convergence of continental fragments with the Sunda margin . In particular, the southwestern part of Sulawesi rotates anticlockwise respect to the Sunda Plate; the northeastern Manado Block and the central North Sula Block move toward the NNW and rotate clockwise; the East Sulawesi is pinched between the North Sula and Makassar blocks (Figure 4). The left-lateral strike-slip Palu-Koro fault is the main active structure in Sulawesi: it bisects the island and connects to the Minahassa Trench, where subduction occurs. The Palu-Koro fault zone accommodates 42 mm/yr and shows a transtensive behavior more complex than a simple strike . This deformation is most likely explained by the presence of a pull-apart structure that may be localized around the Palu area (Figure 5). Figure 5. Sketch showing a transtensional state of a rock. It is unlikely that a deforming body experiences ‘pure’ extension or ‘pure’ strike-slip. Many tectonic regimes that were previously defined as simple strike-slip shear zones are by now assumed as transtensional. As such, transtensional regions are characterised by both extensional structures (normal faults, grabens) and wrench structures (strike-slip faults). Following the Mw7.5 earthquake, a series of tsunami waves hit Palu, Donggala and Mamuju decimating the coastline, flattening homes, destroying several inland areas in Central Sulawesi [watch the video below]. Indonesian Agency for Meteorology, Climatology and Geophysics (BMKG) initially issued a tsunami warning but eventually revoked it. << The decision was based on visual monitoring and further monitoring using the equipment [tsunami detection buoys] at sea for 30 minutes. The BMKG did not see any significant change in the sea level. That’s why they ended the alert >> BNPB spokesman Sutopo Purwo Nugroho said in a statement . The eastern Indian Ocean basin is a region of high earthquake and volcanic activity, so tsunamis should come as no surprise. Yet, geoscientists are doubtful. Could the Palu earthquake alone have generated such a big tsunami wave? Eighteen tsunamis have crashed in the area since 1900 by large shallow earthquakes  and among them we can’t forget the tsunami that hit the Indian Ocean following the December 26, 2004, earthquake in Sumatra . The controversy about the ‘surprise’ tsunami however arises when we look at the tectonic setting of Sulawesi island and the devastating effects documented on the coastline. Tsunami waves are generated by a sudden vertical motion of the seafloor. They are therefore mostly triggered by dip-slip earthquakes where the block of rock on top of the fault, also called the hanging wall, moves up, which pushes the overlying water column up [watch the animation below]. But the Palu earthquake occurred along a strike-slip fault, meaning the motion was mainly horizontal. It is therefore very unlikely that such a large tsunami could have been originated by earthquake rupturing alone. ¤ A submarine landslide: triggered by the main shock, a submarine tectonic displacement may have generated or augmented the tsunami waves. ¤ A complex bathymetry: the seafloor in the Palu Bay is not flat. If there is a slope, even an horizontal motion of the seafloor can produce an apparent vertical motion . There is still no evidence that any of those hypotheses (landslide or seafloor slope) is the actual reason. They could be both too. Besides, the intensity of the tsunami seems to be more related to the shape of the Bay, which naturally acts as a funnel for the tsunami waves. As yet, a straightforward interpretation seems hasty and further analysis should come in aid. Rescue and damages: what now? The confirmed death toll from the Palu earthquake and tsunami has risen to 1,407  together with thousand of buildings destroyed and over 61,000 people displaced . The full scale of damages in the region can already be guessed by watching the dramatic pictures and videos spread online. First aid has already been mobilized through several nonprofit organizations and charities, and everyone’s help is essential in these circumstances. The author thanks the IPGP Seismology and Tectonic Labs for the useful material and discussion. The condition of women in the workplace has not always been easy. Even though the mentality of the people is changing towards inclusion and equality, it is a long way before things really change. We always observe unbalanced number of women versus number of men, unbalanced competition among colleagues for career promotion and responsibility and unequal wages between women and men in many places. Moreover, the situation can even take a turn for the worse when the woman becomes pregnant and needs to handle her family life and her professional career at the same time. In this context the support of female colleagues in sharing experience becomes very important. By developing networking, we can get information about how to manage professional but also personal situation, discuss about inclusive workplace environment and relationship with colleagues. 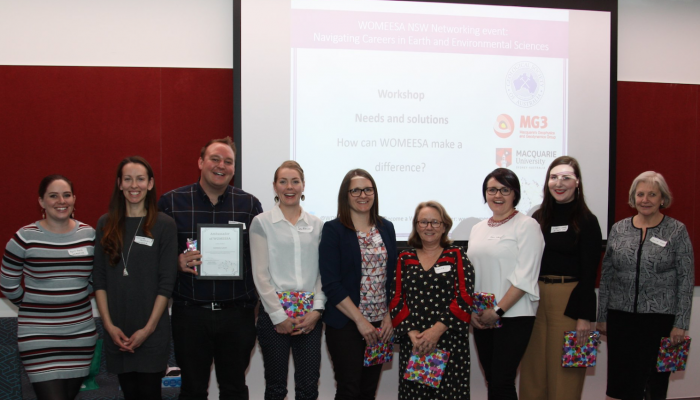 Recently, WOMEESA (Women in Earth and Environmental Science Australasia) network organized a meeting at Macquarie University in Sydney for sharing experiences among different generations of women geoscientists ranging from industry to academia. The meeting started first with two invited speakers from Oil search (Julianne Lamb) and Pells Sullivan Meynink (Felicia Weir) representing industry. They shared their own experience from undergraduate to professional life and how they managed the difficulties -professional and personal- met during their lives. Then, the discussion focused on the career pathways of 4 different generations of geoscientists: Jessica Walsh (PhD candidate, University of Wollongong), Shari Gallop (Lecturer in Environmental science, Macquarie University), Kelsie Dadd (Curious Minds) and Anita Andrew (Environmental Isotopes). The panel showed the obstacles and complications that a female geoscientist can face (as for instance, competition with a male colleague, promotion/monitoring PhD candidate, find a balance between professional career and family life). The panel tried to reply these questions from their own experiences. Their conclusion pointed out the importance of developing a strong female network where to speak up, share and provide advices to common issues. In the last part of the evening, working groups were formed to think at how WOMEESA can help the new generation of geoscientists. Among the suggestions: to encourage girls to study Earth Sciences during events such as the National Science Week, to organize social and gathering events where female geoscientists can develop a strong network, to let female students be monitored by female professors. Some of these ideas have already been implemented in other institutions such as the EGU or the AGU. Our wish is to have the opportunity to exchange in the future with WOMEESA. Q: Why and when was the idea of WOMEESA born? Heather : The idea to form a network of women working in the fields of earth and environmental sciences was born at the Dorothy Hill Women in Earth Science Symposium held at the University of Queensland in November 2017. We realised that despite some existing industry and field-specific networks, there was not a single overall network that included everyone working in these fields across industry, academia and government. Q: In your opinion, how long will it take it to change the situation? Heather: We need to change the present culture of equity and inclusion and so this will likely be a gradual change, but hopefully we will get there by providing continued pressure for change. Heather: We need continued and greater support at national and institutional levels to ensure a culture of equity is supported and implemented. Initiatives such as Science in Australia Gender Equity (SAGE; http://www.sciencegenderequity.org.au/) and Superstars of STEM (https://scienceandtechnologyaustralia.org.au/what-we-do/superstars-of-stem/) are critical to this cause and are definitely making a positive difference. Q: What is the most important thought we need to change first? Heather: There has been much recent media coverage of the challenges and issues facing women in STEM careers and now it is time to see change. We need to see innovative solutions and support for women at all career stages, as well as those in the early stages in their career. Through our networking events, WOMEESA aims to identify these solutions and then work to bring them to reality. Q: What will be the impact of WOMEESA on the evolution of the situation of women in academia or industry? Q: Which public are you targeting and are you happy so far about the first events of WOMEESA? Heather: Those interested in a career in earth and environmental sciences are encouraged to join WOMEESA. We support diversity and welcome all genders to the network. The network will be defined by the needs of its members and so this will be dynamic based upon our growing member profile. We currently have 280 members from 6 countries, with 96% being women. The majority of our members are postgraduate students and those at early to mid-career stage (75%) but we also have undergraduate students and members with greater than 15 years experience. At present, 64% of WOMEESA members are from academia, 17% from industry, 13% from government with the remainder employed in other sectors. We are thrilled to have held the first WOMEESA networking event in Sydney. We are also hosting networking events at the inaugural Australian Geoscience Council Convention, AGCC 2018, in Adelaide, Australia in October 2018 and at the Geoscience Society of New Zealand (GSNZ) conference in Napier, New Zealand in November 2018. We are excited that the NZ Prime Minister’s Chief Science Advisor, Juliet Gerrard will be attending our event in New Zealand. Q: A last word to encourage people to join WOMEESA? Heather: We will be much more effective to create change and support women in earth and environmental sciences if we form a critical mass with a unified voice. Through the hard work of some of its members, WOMEESA have already shown the power of the network by successfully lobbying for the provision of childcare at the Australian Geoscience Council Convention (AGCC 2018) in October. If you want to learn more about WOMEESA do not hesitate to check their website (https://www.womeesa.net). Haven’t you heard about the recent major earthquakes which stroke the globe? No worries, the ECS-reps will post a quarterly report with basic information about the latest earthquakes you can’t miss. Let’s start with June, July and August 2018. Figure 1. 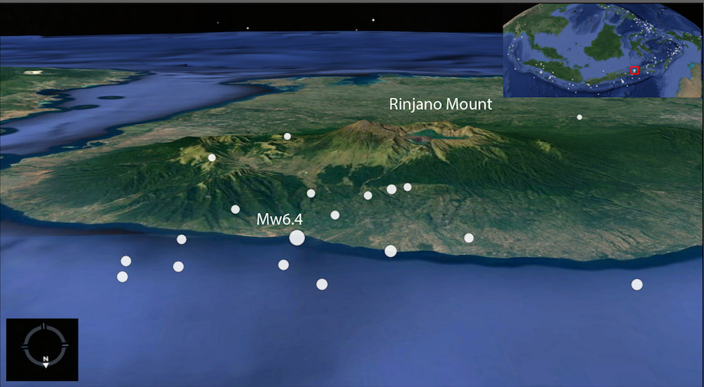 Location of Mw> 5.0 earthquakes (small circles with colour scale showing the depth). Harvard CMT of death tolls events and the greatest event of magnitude Mw8.1 recorded in the period June-July-August. 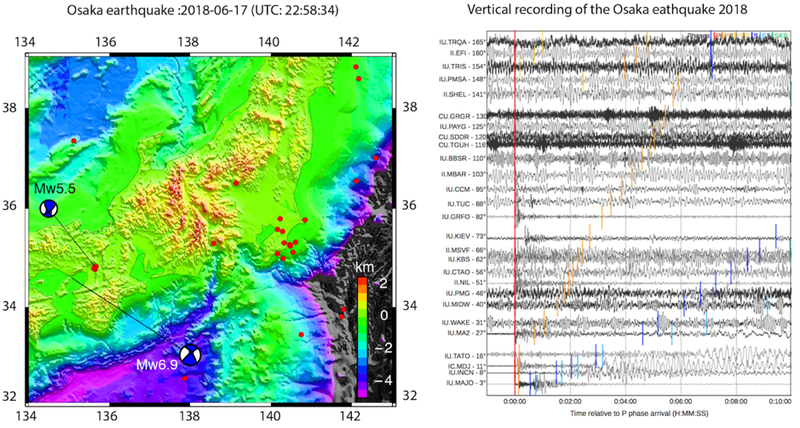 Between the 1st June and the 31st August, 425 earthquakes with magnitude Mw above 5.0 were recorded by the international network broadband seismic instruments and listed in the USGS catalogue (figure 1). Among them, 32 events showed a magnitude Mw> 6.0 and 4 large earthquakes (Mw>7.0) were observed. Among these 425 earthquakes, we can count 200 shallow events (<20 km) and 76 deep earthquakes (>100 km). 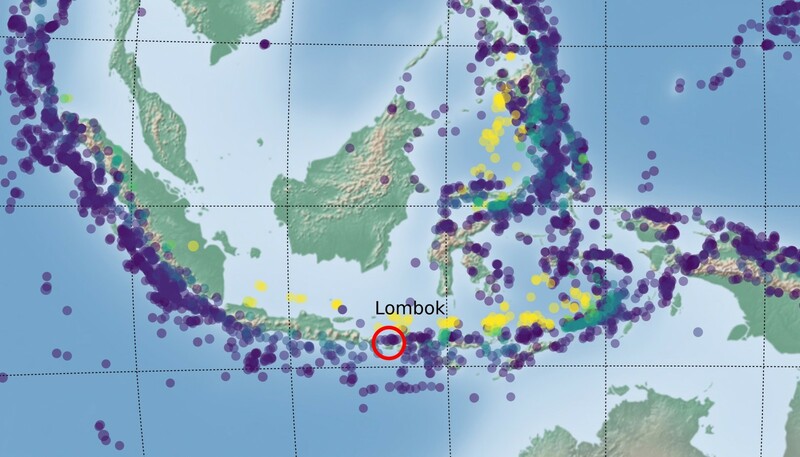 During this last quarterly, the seismic activity in the lesser Sunda islands (red square on figure 1) was very active, as we will see later in this report. 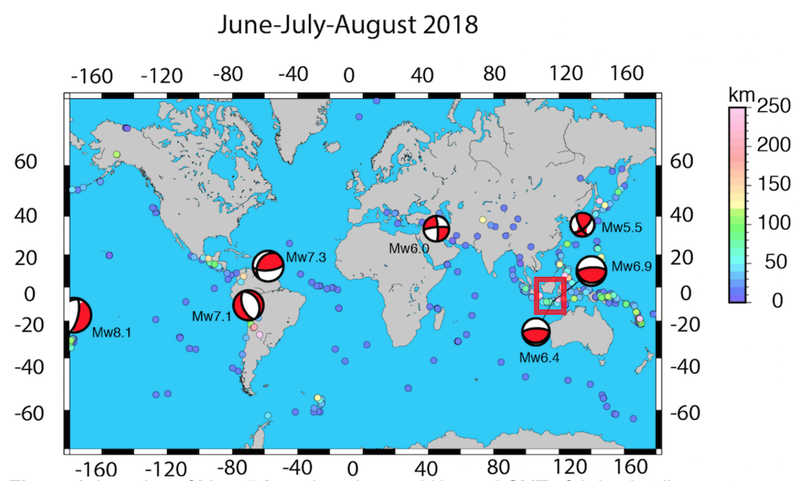 Subduction zones in South East Asia and Central America knew a strong activity this summer in comparison with other regions. Let’s have a look at South America: we can observe 2 large earthquakes occurred in August (Venezuela on the 21st and Peru on the 24th) few days after the Fiji earthquake (Mw8.1) on the 18th (Table 1). Could we argue that the Fiji earthquake triggered the Venezuela earthquake (Mw7.3) and that, in turn, the Venezuela earthquake triggered the Peru earthquake (Mw7.1)? A recent paper by O’Malley et al. supports the idea that a large earthquake can trigger teleseismic events. Table 1. List of death tolls in the period June-July-August. In spite of the progress in engineering seismology and a better awareness of the rules of conduct in case of earthquake, some of these events always kill relatively too many people. That’s why we call them “death toll”.During this summer, 564 persons were killed after death tolls in Osaka in June (Mw5.5), in Lombok-Sumbawa in July (Mw6.4) and Kermanshah on August (Mw6.0). June was characterized by 120 seismic events with magnitude Mw above 5.0 and only 1 event with Mw6.1 in Vanuatu. This month was also characterized by a strong volcanic activity in Hawaii (26 events with Mw above 5.0 were recorded). Figure 2.a. On the left: Location and CMT Harvard Solution of Osaka quake (17 June 2018) and Kobe quake (19 January 1995). Red dots correspond to earthquakes with magnitude Mw>5.0. On the right: Seismograms of the Osaka earthquake from the global seismic network. On 17 June, a Mw5.5 hit the northern region of Osaka Prefecture (figure 2.a.) where more than 9 million people live . In this area, the seismicity is controlled by a system of strike slip faults  which accommodate the convergence of the Philippine plate and the Eurasian plate. The seismic activity of this region is relatively quiet in comparison with the northern part of the islands and subduction earthquakes. Nevertheless, the region was struck by 2 great historical earthquakes (Mw>7.0) in the last 500 years (1995 in Kobe Mw7.2 and 1596 in Keicho Fushimi M7.5) [4,5]. In 1995, the Mw 7.2 Kobe earthquake broke the 40 km long and 20 km wide fault plane of the Arima-Takatsuki fault zone (ATFZ). This quake killed 6,433 people and cost $100 billion. The 17 June event was located in the same area where a large earthquake was expected in the last 30 years after the 1995 earthquake . 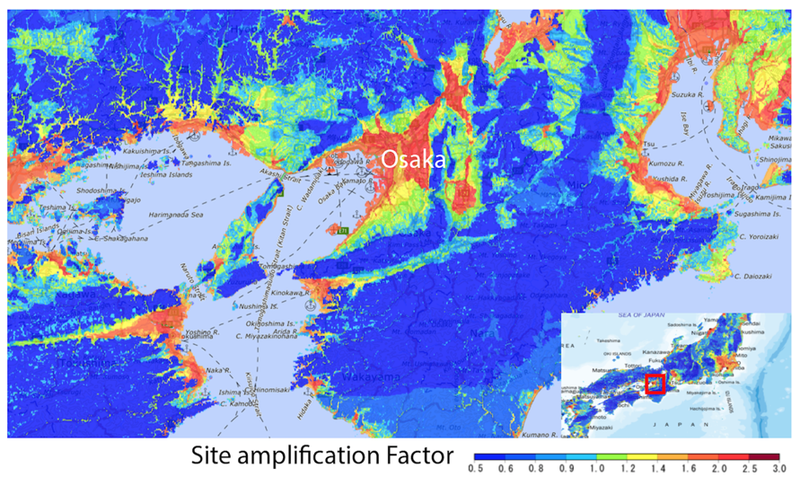 Seismic hazard studies in this region show a strong site amplification of the area to ground motion (figure 2.b.). The relatively low magnitude event was amplified in some areas  and became a death toll due to collapsing concrete walls : a danger knew since the Miyagi earthquake (Mw7.4) in 1978 , where several aspects of engineering seismology and soil behaviour started to be developped in Japan. July was characterized by 132 seismic events with magnitude Mw above 5.0 and 9 events higher than 6.0. Volcanic activity in Hawaii continued during this month with about 22 events recorded. As in June, July also knew a death toll event. Figure 3. 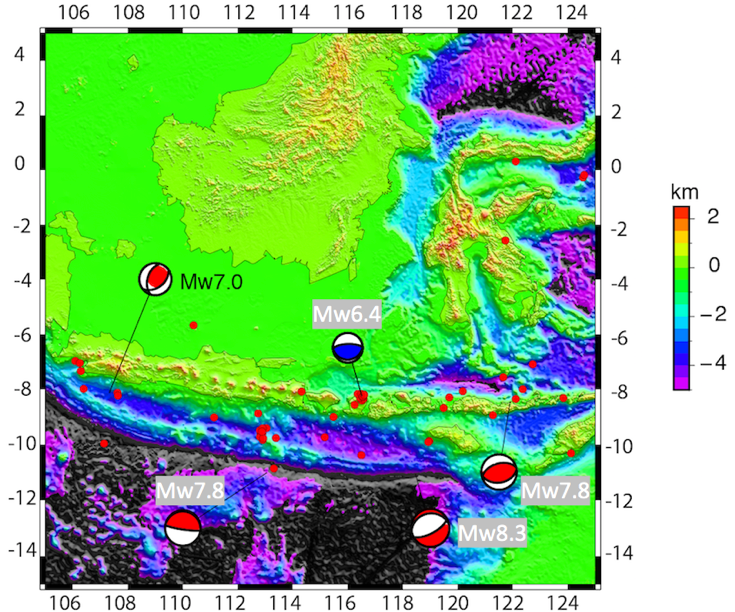 Location and Harvard CMT solution of the Lombok earthquake (Mw6.4) and historical great earthquakes (Mw>7.0) in the area. Local seismicity (red dot) during the month. Death tolls are shown in grey. 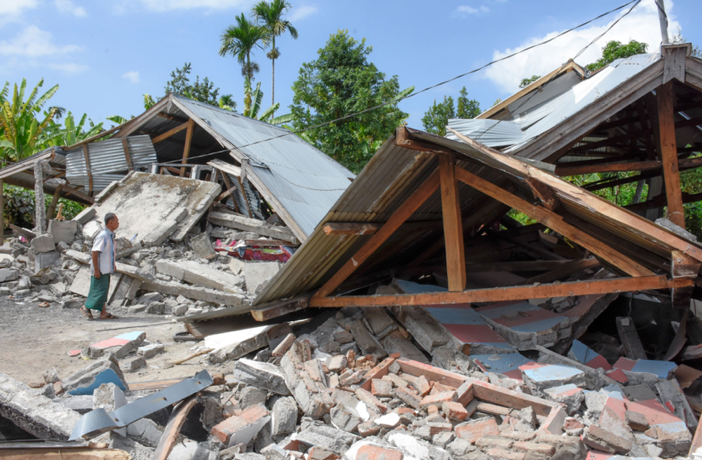 On the 28th July, a magnitude Mw6.4 event  shook Lombok island (Indonesia) killing 20 persons and injuring 401 (figure 3). Lombok island is a paradisiac island east of Bali with a population of about 3.4 million people. The region had previously known large earthquakes along the Sunda subduction zone (Table 2): in 1977 in Sumba (Mw8.3), where 177 people were killed and 1,100 injured; in 1994 in Java (Mw7.8), with 250 killed and a triggered tsunamis [11,12]; in 1992 in Flores islands (Mw7.8) with 2,500 deads. Table 2. Death tolls along the Sunda subduction zone. The Mw6.4 Lombok event nucleated within the megathrust subduction zone in the south and the Flores back arc thrust fault in the north . 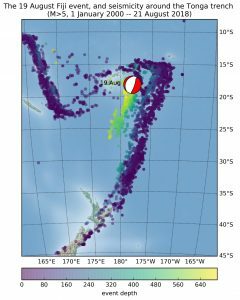 Even if this event occurred in a shallow part of the crust (about 15 km deep), no tsunami was reported afterwards. Recently, Koulali et al. (2016)  show that, from GPS measurement analysis, this region could expect a large earthquake (Mw>7.0) within the next years, implying that the Mw6.4 event could change the recurrence time of this kind of events in the future. Figure 4.a. Seismicity across the Lombok island and the location of the Mw6.4 event (28th July 2018). Lombok island is also characterized by the presence of an explosive volcano (Rinjano, 3726 m) which knew its last eruption in 2016 . The 2018 earthquake did not trigger any eruption but rather a landslide of the northern face where the seismicity was mainly concentrated (figure 4.a.). More than 1,200 hikers were stuck on the volcano , 5,448 houses were destroyed and more than 10,000 were displaced  (figure 4.b.). August was characterized by 168 seismic events with magnitude Mw above 5.0 and 22 events higher than 6.0 (with 4 large earthquakes). The low volcanic activity in Hawaii continued during this month with about 1 event recorded. On the 5th August a  Mw6.9 event (figure 5) stroke Indonesia again in the same area [18,19]. August was the worst month of the year with 513 killed. 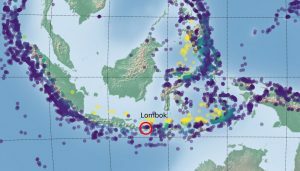 Strong seismic activity [20,21] is observed on Lombok island generating a series of landslides but no eruption was reported. This Mw6.9 event also caused the uplift of the northern part of the island (maximum uplift of about 25 cm) [22,23]. Another event hit Lombok island 2 weeks later on the 19th August with a Mw6.9. This event also produced an uplift in the northen part, but affecting another fault. Figure 6. Location and Harvard CMT of Kermansha earthquake (M6.0 on 25th August) and historical great earthquake in the area. Death tolls are shown in grey. 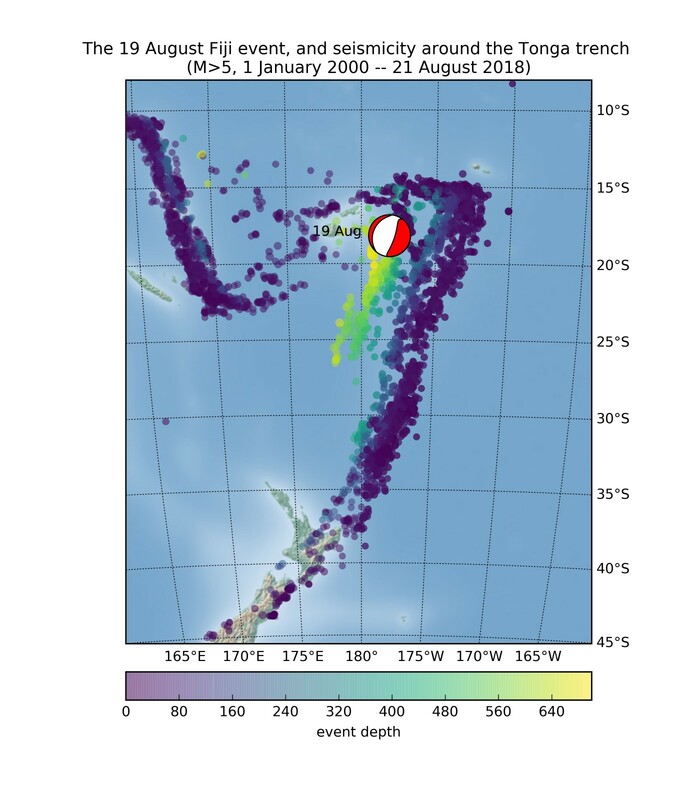 August also recorded the biggest event of the year with a Mw8.1 event (figure 1 and Table 1) near Fiji  without damaged, thanks to its depth (~ 560 km). Later in the month, on the 28th August, another death toll of Mw6.0 (3 deaths and 243 injured people) hit Iran (figure 6). This region has already been stroke in the past: on the 12th November 2017, a Mw7.3 event killed about 630 persons [24,25]; eastern, the Manjil Rudbar quake (Mw7.4) in 1990 (figure 6) killed between 35,000 and 50,000 people [26,27]. 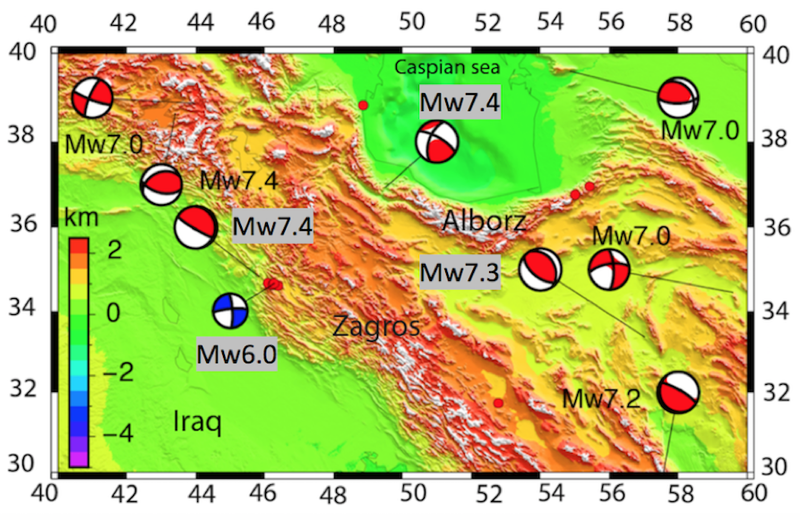 This strong seismic activity in Iran is due to thecollision zone between the Arabia plate and the Eurasian plate, originating the Zagros Fold thrust belt, and the presence of several active strike slip faults. As we can see on figure 6, the region was stroke by 8 large earthquakes (Mw7.0) in less than 50 years and 4 death tolls listed in Table 3. Lin et al. (1988). Paleoseismic events and the 1596 Keicho-Fushimi large earthquake produced by a slip on the Gosukebashi fault at the eastern Rokko Mountains, Japan.The Island Arc,7,621–636. An investigation of the Miyagi ken oki, Japan, earthquake of June 12.1978. NBS Special publication-592. Gusman et al. (2009). Analysis of the tsunami generated by the great 1977 Sumba earthquakes that occurred in Indonesia. Bulletin of the Seismological Society of America,99 (4),2169–2179. Abercrombie et al. (2001). The 1994 Java tsunami earthquake: slip over a subducting seamount. Journal of Geophysical Research,106 (B4),6595–6607.